Kai & Marie Poppo A mysterious youth and a mysterious small creature. Through strange circumstances, they end up traveling together. Kai has a gung ho personality befitting the title of a Main Character, and being the Main Character, he becomes involved in all sorts of trouble. He's pitiable in more ways than one. Marie Poppo can't read the mood (or at least pretends not to). Well-rounded in battle, his base characteristics are high but since he can't use Hyper Cards until the latter half of the game, he'll be forced to stock up on other types of cards for a while. 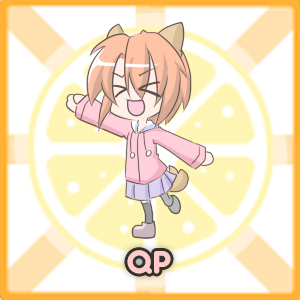 QP The Main Character of "QP Shooting". A fool of a dog. In general, everything's OK as long as she has pudding, and she can and will do anything in order to get pudding. Definitely can't read the mood. A well-rounded character with no weaknesses and average HP. Her Hyper Card is useful for both offense and defense, and can be used from the very beginning. 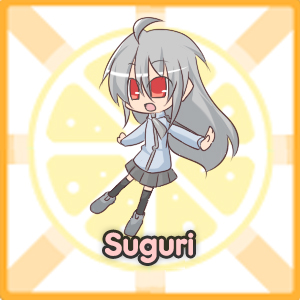 Suguri The Main Character of "Suguri", "Acceleration of Suguri" and "Acceleration of Suguri 2". Over ten thousand years old. Takes things at her own pace. A battle-type that excels in evasion. Whereas she can completely nullify small attacks, she also suffers from the danger of becoming knocked out by a single hit. Her Hyper Card's power is maxing the rolls of dice, and can be used midway through the game. 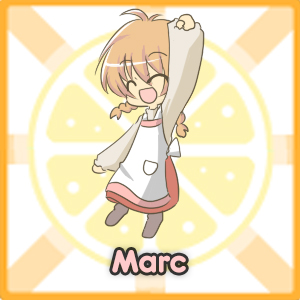 Marc The Main Character of "Flying Red Barrel: Diary of a Little Aviator". A girl who loves to fly through the sky. There are some questionable reports of seeing her transformed into a pig. She's an indirect damage type whose Hyper Card can deal damage without her actually engaging in battle. She has some defensive abilities too, but her HP is low.